Asheville features the unique, special, handcrafted, and hard-to-find. Downtown Asheville shops and galleries feature a unique mix of locally-owned establishments. 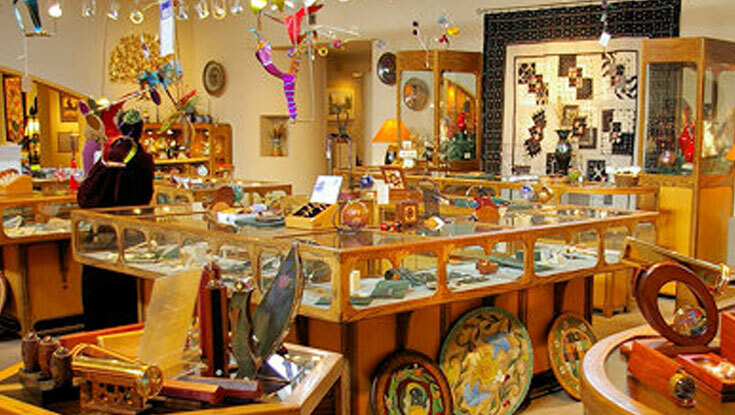 Downtown art galleries offer specialized items such as custom jewelry, quilts, furniture and one-of-a-kind gifts. The city is pedestrian friendly, with wrought-iron benches throughout downtown, and many eateries have open-air dining sections that allow visitor to enjoy the city's mild weather. In downtown Asheville, it is a pleasure—not a stress—to go shopping. One of the most interesting and inviting spots for downtown shopping is the Grove Arcade. This renovated historic building is worth a visit to admire the architecture alone, but it's also a wonderful place to wander, shop or visit galleries. The dining options range from Chicago-style hot dogs to frozen custard, wine bars to coffee shops, upscale restaurants to sidewalk cafes. The area nearby the Grove Arcade is also lined with several shops and restaurants. There's a reason Asheville's arts scene is heralded again and again. In downtown Asheville, there are 30 galleries belonging to this organization alone. The group offers maps and self-guided tours, as well as City Center art walks. You can also find the works of 150 artists at Woolworth Walk in the heart of downtown Asheville. This picturesque side street in downtown Asheville features a mix of unique shops like Beads and Beyond, the paint-your-own-pottery spot Fired Up Creative Lounge, or Art Deco-inspired jewelry at Overström Studio. While you're there, stop off for a bite at Early Girl Eatery for organic Southern cuisine, Laughing Seed Café for vegetarian cuisine or The Market Place for inventive food. This corridor, with Broadway to one side of Patton Avenue and Biltmore to the other, is lined with several popular downtown Asheville shops and true local institutions like Mast General Store. Along Broadway, the diverse shopping ranges from L.O.F.T. - Lost Objects Found Treasures for interesting finds, C and Co. for all natural body goods, to Bruisin' Ales, devoted to beer lovers. This funky and eclectic neighborhood is the place to shop for the delightfully unexpected, from political bumper stickers to punk tee-shirts to new age books. While you're there, sample some French comfort food at Bouchon.